This photo was taken in 2006. 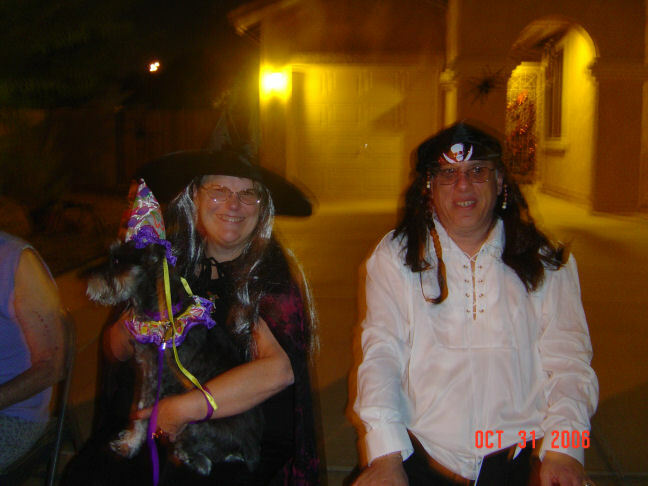 I was dressed up as a witch and Hal as a pirate. Millie, our miniature schnauzer, reluctantly dressed up as a clown. 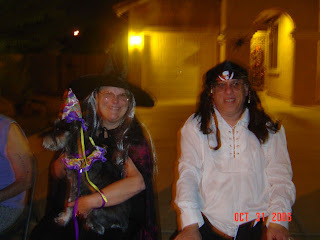 Here in AZ it is normally warm enough that we sit outside in our driveway and pass out candy to the children (and a few adults too). Many of our neighbors do the same. Such fun. Love to see the cute and inventive costumes the children have chosen to wear. The next photo was taken last year I believe. 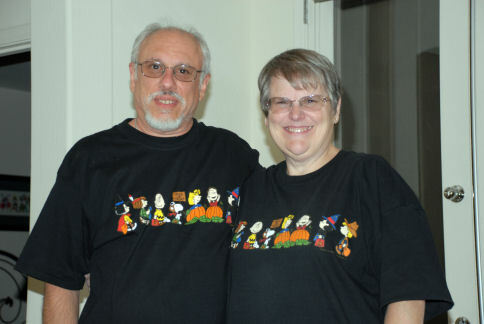 We had matching Halloween t-shirts. Hope you all have a fun and safe Halloween. Have a Beary Good Day .... Enjoy your weekend. If you would like to see the complete collection of Build-A-Bear Stampin' Up! Exclusive Products, you can see them HERE. Today I wanted to show you how you can give a completely different look to a card with the exact same elements just by changing the position on the card and also the card stock color. Yesterday I did this card using Pear Pizzazz and today I used Poppy Parade for my colors. Just finished this Christmas card minutes ago and couldn't wait to show you. I used the In-Color Pear Pizzazz as my focal color and thought it looked great for this holiday card. One of my favorite Hostess Gift Sets this year is Peaceful Season which is a level two gift. 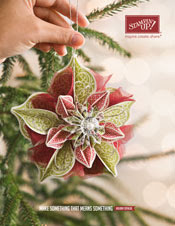 It is in our Holiday Mini Catalog. Anyone placing a minimum $300 (before tax & shipping) order or workshop order (where you are the hostess) is eligible to receive this set. This ties in too with my challenge yesterday of using your favorite paper punches. The scallop punches are some of my favorites and we have so many to choose from too. November is almost here, so it is definitely time to get started on your holiday cards. Hope this one gave you some inspiration. Let me know if you have any questions. 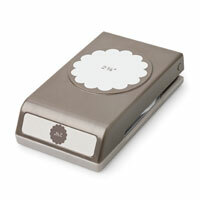 Do you have a favorite Stampin' Paper Punch? I love using them and have almost all that Stampin' Up! has to offer. They truly are a mainstay in my crafting. Which Stampin' Up! Paper Punch is your favorite? My challenge to you is to use it today and create something special with it. Be sure to post a comment with your answers, and also let me know what you created. Have fun with this challenge. Looking forward to reading your replies. Photos of this covered notepad were shown earlier this month here on my blog. Today I am posting a step by step tutorial for you. We really had fun making this project, and it is a perfect gift idea too. 1. Use Old Olive Card Stock 4” x 4” for the window frame and Very Vanilla 3 ½” x 3 ½” as the window. 2. Stamp tree images on the Very Vanilla Card Stock. Then cut both sides of the Very Vanilla Card Stock at 1 ¾”. a. Spacing evenly, align the window Very Vanilla squares using Dotto and place on the Old Olive Card Stock. b. Once all window squares are aligned, go back one by one and adhere with SNAIL Adhesive. 1. Cover is Early Espresso Card Stock cut at 8 ¼” high x 10 ¾” wide. b. Using a bone folder, crisply crease/fold the score lines. 2. Using SNAIL Adhesive, place the completed wind in the upper front of the card. 3. Cut out one sheet of Tasteful Trims on your Big Shot using a 6” x 11” piece of Tempting Turquoise Card Stock or color of your choice. a. Using TomBow Adhesive, attach to cover. Carefully fold over creases. You may need to trim the designs “IF” you want them all the way up on the back side. 1. Using SNAIL Adhesive or Sticky Strip, completely attach this piece of 5” x 8” Crumb Cake Card Stock to the left side. 2. To make a pocket, take a piece of Soft Suede Card Stock 5 “ x 3 ¾” and punch out a top border. Then using Sticky Strip on Left, Right, and bottom sides attach to the bottom of the Crumb Cake piece on the inside left of cover. This will form your pocket. 1. Place the 2 pieces of 3”Old Olive 5/8” Satin Ribbon folded and strategically to hold pen. Secure with tape. Then place a scrap piece of cardstock over this area to secure the ribbon even more. I used a piece from the Tasteful Trim pieces that I cut out. 2. Using glue dots, attach note pad. The reason I recommend glue dots is so that when the tablet is empty you can gently remove it and put in another one. “IF” you are not going to replace the lined notepad then any type of adhesive is fine. This is a perfect gift item, stocking stuffer. We had such fun making them at class on Saturday. I hope you will make some too. I'm temporarily off the internet ... have a friend here for a couple of days from out of state. I promise more blog posts in just a couple of days. Over the years I have given a few gift card holders. Usually I put them in a card I made, but thought ti would be nice to have a special holder for them. Here a simple one I made. I plan to make a few more this week with other designs to share with you too. This is the gift card holder on the outside. The ribbon has been attached using adhesive. The tied ribbon keeps the card holder closed. When you open up the gift card holder, there is a created slot inside made using the Word Window Paper Punch. This time I just layered scraps of card stock on a piece of cut card stock and built my design. Then embellished and added to my card base. Very pleased with the results. Let me know what you think. Thought they would be great for any age and perfect for a birthday card. I can see doing more of these soon. Random placement of the pieces made them quick and easy to create. I used Stampin' Up! Two Way Glue Pen, item #100425, to adhere to together. I also added some brads as an embellishment. You will be amazed at the selection of brads that Stampin' Up! carries. Most are shown on Pg 187 of the Idea Book & Catalog 2010-2011. Having so much fun creating these cards and the card box (shown below). Each one is unique it's in own way and an original as no two are exactly alike. My friend, Kelly, let me know that this type of layering is called Iris Fold. It is found not only in paper crafting but in quilting too. Most I found on the internet used templates for placement. Mine are randomly placed. This is card box I created using the layering technique. I'm really pleased with the results. The card box would make a great gift when filled with cards that you have created. The following photos each show 4 of the 12 cards I made. Thought they looked like a quilted pillow when put together. And my final photo is all 12 cards in one photo .. this one looks like a paper quilt. Please go back to this POST on my blog for an important update on the Holiday Bundles being offered by Stampin' Up!. It will give you information about an additional bundle being offered AND also inform you of a backorder of one product and how it is being handled. card stock and covered all the loose ends. Then used my Crop-A-Dile to punch holes and insert brads. Finished design was placed on a card base using dimensionals. Here are my samples of what I made. Please let me know what you think. There is truly no pattern, you just start playing and placing with scraps of card stock. This is a close up of one of the patterns I created. Each color/line is a piece of card stock. The sky is the limit on what you could crate doing this. Filled in designs could be large or small. Just remember it will add some bulk to your card, so if planning to mail the card don't get it too thick. This technique truly will give you one of a kind original cards. All products used were from Stampin' Up!. Holiday Bundles: You have the opportunity to purchase select products--perfect for Amazing cards, Beautiful packaging, and Cherished gifts--at a 20 percent discount! See bundle information flyer above for more detailed information. It is extremely important that you use the codes listed in the flyer to get the discount on the bundle. My Digital Studio: As of today, there is new pricing on professional printing for My Digital Studio. CLICK HERE to view the new pricing list. Along with these great additional project options, nearly all of our current professional print products have been permanently reduced approximately 15-60 percent--just in time for all your holiday printing needs! New pricing is listed HERE. This is my 2nd post today. Be sure to scroll down on the main page (home page) to view all postings. Today I have completed a video tutorial for you on how to create this layered postcard. It was showcased on my blog at the beginning of the month, and now you can see step-by-step how it was created. If you are viewing this by e-mail, you will need to come to my blog to view the video. The other day on my blog I showed you a card I had completed using the Faux Tearing and Masking Technique. Here's the video I did to show you how to create this technique yourself. It is so versatile, I think you will really like this. If you are reading this from e-mail, you will need to come to my blog to view the video. One of my favorite products by far is the Stampin' Up! Big Shot Die Cutting Machine. I've now owned mine for a couple of years and absolutely love it. It is easy to use, durable and well made. You can use it at home or easily take it with you to a crop or get together with friends to work on cards, scrapbooking or even favors or boxes for weddings or parties of any type. Stampin' Up! offers so many different dies, embossing folders, Embosslits, texturz plates, Sizzlits, and even an line of items for Build-A-Bear Workshops. If you click on Big Shot category on the right side of my blog, you will also see many of my creations using the Big Shot Die Cutting Machine. There isn't a week that goes by that I haven't used it. It truly is a staple in my "must have" list, and I recommend it often to my Stampin' Up! customers. Stampin' Up! has a line of exclusive products for the Big Shot. Don't miss out on these wonderful items. You can only purchase the exclusive Stampin' Up! ones from Stampin' Up!. If you have the Stampin' Up! 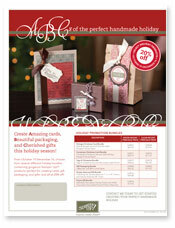 Idea Book & Catalog 2010-2011, the Stampin' Up! Big Shot products are listed from Pages 204 to 217. You can also view the catalog on-line (click on the catalog on the right side of my blog). 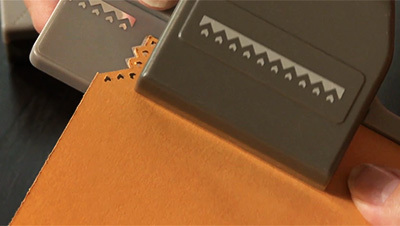 Remember if you are using any die that has fold or crease lines, to be sure to use a Premium Crease Pad with it. It really does make a difference. I highly recommend the Stampin' Up! Big Shot Die-Cutting Machine. You may order from my Stampin' Up! website 24/7 by CLICKING HERE, then click on Shop Now or by contacting me directly. My e-mail link is at the top of the screen. Let me know if you have any questions. My video today will show you 4 different ways to change the look of ribbon using a sponge dauber, sponge, craft ink, Shimmer Mist, and rubber stamp all from Stampin' Up!. This was done using a sponge dauber by rubbing it across the ribbon using Shimmer Paint - Platinum. This scallop look was created using the sponge dauber, Shimmer Paint - Platinum, and by pressing the dauber image along the edges. This look is my favorite. It gives a speckled look to the ribbon using a Stampin' Sponge and Shimmer Paint. The harder you press the sponge, the more intense the color and filled in area. I like using the lighter touch on these as shown in the bottom two ribbons. I used the Stampin' Up! Confetti Stamp Set and Whisper White Craft Ink. LOVE THIS. The craft ink takes a bit longer to dry, but worth the wait. 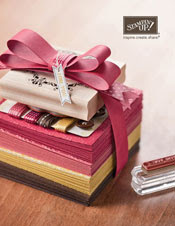 You can really customize ribbons with stamps, adding in any design you desire. Very Vanilla Grosgrain Ribbon was stamped with Marina Mist Classic Ink. The ink bleeds into the fibers, but still gives a customized look to the ribbon. I hope you enjoyed today's tutorial. There are so many ways you can change the look of your ribbon and give your cards and scrapbooks a true customized look. Have fun being creative. You may order from my Stampin' Up! website 24/7 by CLICKING HERE, then click on Shop Now or by contacting me directly using my e-mail link at the top of the page. 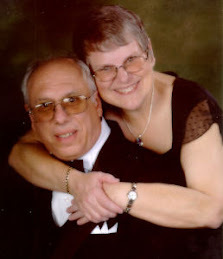 Karen Worrell is a Stampin' Up! Demonstrator, and member of my Stampin' Up! Team KreatesKards. She created this card for our team card swap. It was such a beautiful card that I wanted to share it with all of you too. Karen, thank you for sending me this card. I would like to congratulate Karen on her promotion to Sr. Associate with Stampin' Up! Order Stampin' Up! 24/7 ... CLICK HERE, then click shop now. Stampin' Up! is bringing sparkle to your holiday season a little early this year with a very special gift for our demonstrators and customers! Beginning October 19, 2010, nearly all of our My Digital Studio professional print products will be available at approximately 15-60 percent off regular retail prices! 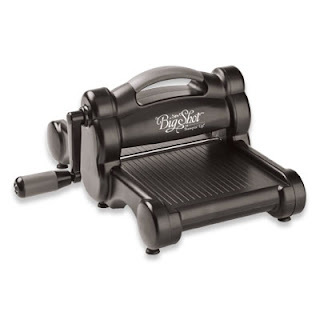 Want to know the best part about this money-saving holiday gift? It never ends! Beginning October 19, most of our professional print products will be permanently reduced! 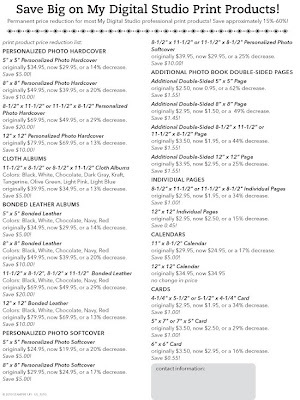 Be sure to take advantage of this significant print product savings--beat the December rush and start creating your holiday photo album books, calendars, and cards today! I've been busy creating with Faux Metal Contact Paper, Stampin' Up! Big Shop Die-Cut Machine, and Flower Folds BigZ XL die and Perfect Polka Dots Embossing Folder. Doesn't this look romantic! I used a battery operated votive candle. Important note: this is paper, not metal .. please do not use a real candle. I layered 3 different sizes of the petal flowers. They are attached together using Sticky Strip. Close up of the small petal. I attached the faux metal to Stampin' Up! brushed silver card stock. Another view. This is a great gift idea too. If you would like to see more information about the Faux Metal contact paper CLICK HERE. Stampin' Up! products can be ordered 24/7 thru my Stampin' Up! website, by clicking here then clicking on Shop Now. Pen has been attached with ribbon. Wanted to share one of our class projects with you that will be done later in the month. It is a covered notepad. I purchased the notepads at the dollar store, then covered and decorated using Stampin' Up! cardstock and our new Tasteful Trim BigZ XL die (item #120893). I also used the window technique to give an illusion of a window with a view of the trees outside. You can't beat the quality and variety of Stampin' Up! products. If you would like to place an order, CLICK HERE then click on shop now. Our digital downloads for the month of October are here! If you would like to view our complete list of My Digital Studio download offerings, CLICK HERE, then click on SHOP NOW, then Digital Crafting.